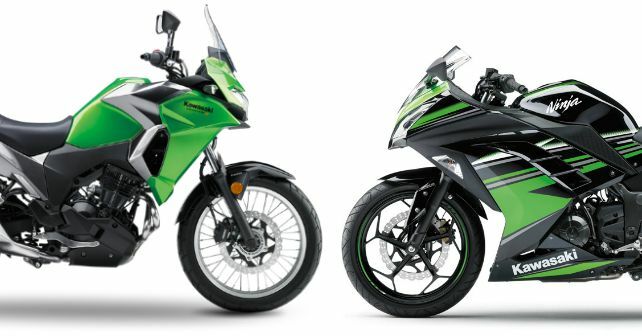 Kawasaki Versys X-300 vs Kawasaki Ninja 300: What is different? The smallest Versys uses the same powerplant as the Ninja 300 but in reality, they are poles apart. Find out more. Kawasaki took the wraps off the Versys X-300 at EICMA last year. The motorcycles garnered a lot of attention among enthusiasts in India given the equipment that it comes with to tackle our road conditions. Meanwhile, Kawasaki also has the first mover’s advantage in bringing a parallel-twin adventure tourer. But underneath the skin, this baby Versys shares its engine with the Ninja 300. The 296cc parallel twin motor makes 39.4bhp in the Versys X-300 and 38.4bhp in the Ninja 300. Peak power of the Versys 300 also comes marginally higher up the range at 11,500rpm instead of 11,000rpm in Ninja 300. Both motorcycles have also been fitted with the same 6-speed transmission. And that’s where the similarities end. Both motorcycles are extremely different in nature and bred to perform different functions. Here’s a look at how far apart these two really are. 1.) Engine: Although on paper, the specs of the two vehicles may be similar, the Versys 300 has been retuned to deliver more punch in its low and mid-range. This should really come in handy when riding on narrow low-traction trails. The Ninja 300, on the other hand, feels best higher up the rev range. Kawasaki has also fitted the Versys 300 with a focused ADV-style exhaust. In the baby Versys, the header pipes are closer to the engine for better ground clearance. For better heat management, the Versys employs the new Kawasaki Air Management System. This essentially channels the hot air away from the rider towards the bottom of the motorcycle. 2.) Chassis: The Ninja 300 is based on a steel tube diamond frame, the Versys X-300, on the other hand, gets an all-new chassis. This new frame makes this bike a bit narrow from the centre which plays a vital role in giving it the right adventure touring stance. 3.) Suspension & Wheels: To aid the Versys in absorbing the uncertain rugged terrain, Kawasaki has fitted it with 41mm telescopic forks up front, 3mm longer than the ones on the Ninja 300. Front suspension travel is also up by 10mm to 130mm, while the rear gas charged suspension can travel 148mm. Apart from the suspension setup, an adventure tourer also demands wheels for the purpose and in that regard, the Versys X-300 doesn’t disappoint. It comes fitted with a 19-inch 100/90 section tyre up front and a 17-inch 130/80 section rear. Knowing that the motorcycle will be ridden hard on trails, the Japanese bike maker has smartly fitted it with spoke wheels. The Ninja comes fitted with 17-inch alloy wheels on both ends, with a 110/70 section at the front and a 140/70 tyre at the back. 4.) Dimensions & Ergonomics: While the Ninja 300 is an entry-level sports bike, the Versys X-300 is an adventure tourer – and it is this that makes a huge difference in the ergonomics of both these vehicles. The Ninja 300 has a slightly crouched riding posture thanks to the flat handlebar and rear-set footpegs. The Versys 300 has a tall handlebar with relatively upright riding posture that will feel a lot more comfortable over long distances. Thanks to the 180mm ground clearance the rider also sits higher off the ground on the Versys. Both motorcycles have impressive ergonomics, but the Versys will surely feel a bit more comfortable for a pillion rider. 5.) Price: Now this is where things start to go downhill for the Versys. In Kawasaki’s product portfolio, the Ninja 300 is priced at Rs 3.60 lakh and the Z650 carries a sticker price of Rs 4.99 lakh. Kawasaki has positioned the Versys X-300 in between, at Rs 4.60 lakh. Now, this price also includes panniers and a pair of additional lights fitted on the bike. Even with these few additional accessories, the Versys 300’s price will hover close to the 5.2 lakh mark (on-road) which some might feel, is a bit too much money for the motorcycle on offer.